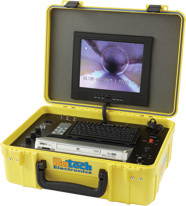 Ratech’s Plumber’s Elite JR. small pipe inspection system is available with a FULL SPECTRUM SELF-LEVELING COLOR CAMERA or A STANDARD COLOR camera at a very affordable price; maintaining all the quality of our high end systems. The miniature color inspection camera measures just 1.375" diameter by 1.85" in length and is capable of inspecting pipe diameters as small as 2" (straight runs) while also negotiating 90 degree bends in 3" and larger pipes and services. Lighting for the camera is provided by high intensity LED lights producing a detailed picture for easy analysis of the pipeline condition. The Elite JR. camera control unit (CCU) features a Hi-Res 10" color LCD flat panel monitor, controls including a camera test terminal, variable lighting, microphone, camera test port and AC/DC power input. A mini keyboard is provided for on-screen text display. Recording is available using the built-in DVD recorder or the convenient SD card recorder where you can take digital still photos or mpeg video.